Breakfast is my favorite meal of the day. 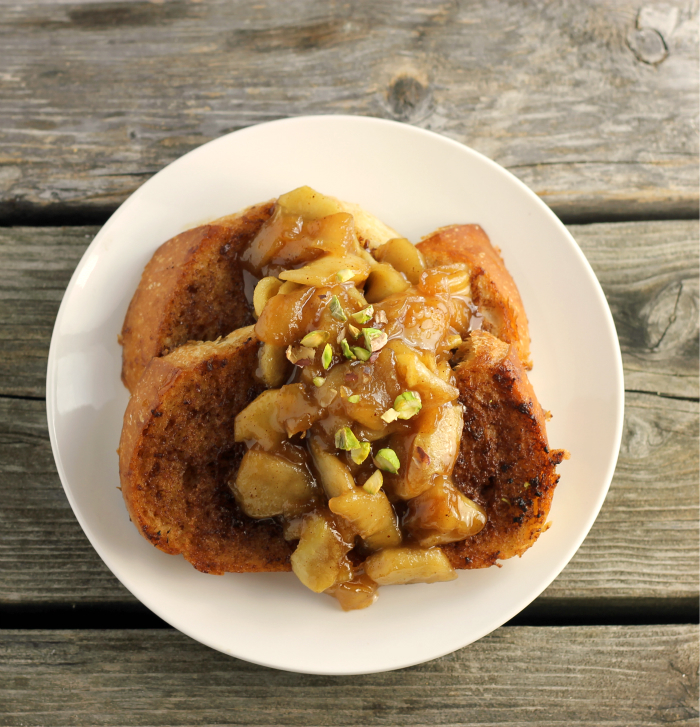 This apple cinnamon toast is great for breakfast but can be enjoyed anytime of the day. I have been making some really simple recipes of late, maybe because time is a factor or just too many things going on. I was hoping to get ahead of things this past weekend but didn’t quite do that. And the weekend that is coming up is going to be a super duper busy weekend. The town that we live in has a music festival at this time every year. All our kids will be coming home to enjoy the music and bands that gather for this event. All of them will be staying at the house, so it will be a little crowded, but that is okay. We will also have the two grandchildren over the weekend. Which I am super excited about. Then on Sunday, we will be celebrating our daughter’s birthday, Lisa that turned 30 today. Also, my grandson will turn 1 year old on Sunday. I can’t believe that he is turning a year old already. He is starting to walk and do all the things that toddlers do, he isn’t a little baby any longer. Whew! See I told you it’s busy. 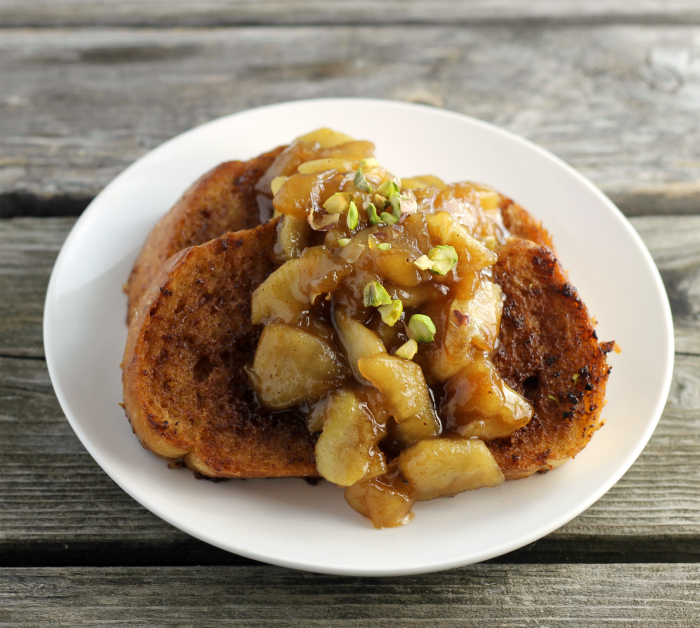 So back to simple recipes… I have been toying around with grilling some bread, well not any bread, but cinnamon and sugar bread to make cinnamon toast and topping it with apples. At this time, I don’t have a grill pan, but it is on my list of the one of the things that I would love to have. So for this, I use my George Forman grill, which is kind of on its last leg, but that is another story. The George Forman grill didn’t grill the bread as well as I hoped that it would do. But it was delicious anyway. I caramelized apples to top the cinnamon toast with. I wasn’t quite sure what to expect when I made this. There are many things that are rolling around in this head of mine that I think will be delicious, only to find out when I make the idea it turns out awful. The whole time I was eating this I kept thinking that this would taste like a sweet roll. Yeah, baby, I got this one right. A lot less work than making sweet rolls, but man it does taste delicious. Melt butter in a skillet. Add the brown sugar and mix until well blended. Stir in the apples and cook over medium heat for about 5 to 7 minutes or until apples are soft, but not falling apart. Heat a grill pan or skillet over medium heat. Combine the 2 tablespoons of soft butter with the 1 1/2 teaspoon of sugar and 1/2 teaspoon of cinnamon. Generously butter each side of the bread with the butter mixture. Place the bread on the hot grill pan or skillet. Cook for about 2 minutes or until the edges of the bread start to turn brown. Flip over and continue to cook for another 2 minute or until the edges of the bread start to turn brown. Top with the caramelized apples and serve. That is apple pie on toast! I’d love it for breakfast! 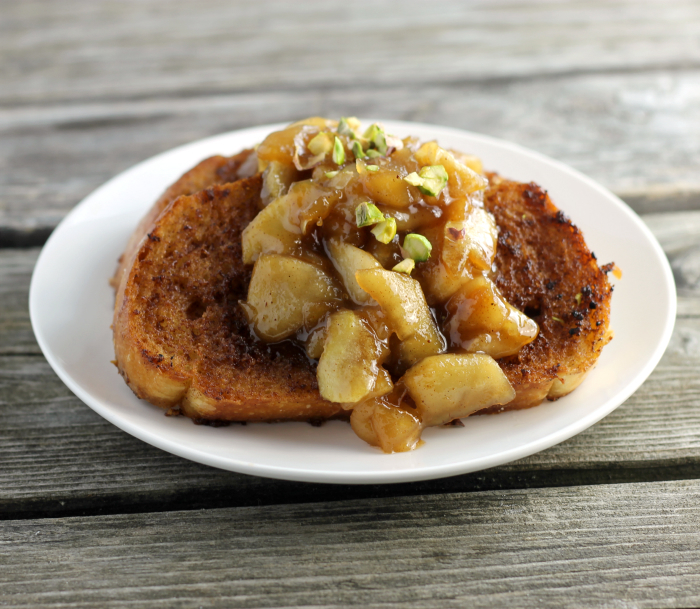 Wow, this is how I would love to start my day…the look of this caramelized apples over cinnamon toasts is just so tempting…thanks for the recipe. I should try grilling bread — fun idea. Particularly using THIS recipe. Wow, this looks so good! Fun dish — thanks.